Some call her the “Purveyor Of Fun”, some refer to her as the “Local Tattoo Goddess”, most of us just call her Mimi Masher. 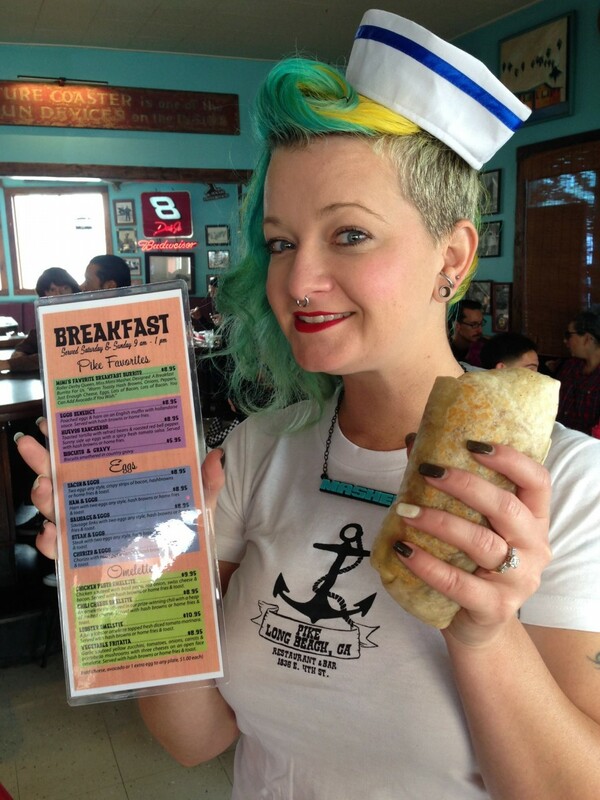 Mimi Masher even has a Burrito named in her honor! So about that tattoo I always wanted… Mimi’s first tattoo was a Varga Style Hula Girl when she was 18. Now of course I didn’t ask Mimi for her age but over the years she has added more and more to her tattoo collection. About two years ago she started her back piece. It is meant as a show piece for the tattoo artist Robert Ullom. Robert, who works at Ghost Wolf, was looking for someone with an outgoing personality and willingness to show off the finished masterpiece. The two met through Mimi’s husband Sean. I had to ask, I’m just curious, what happens to tattoos over time, you know when you get older. For right now that is not a problem, to keep the tattoo, and herself, in shape, Mimi uses the weighted hula-hoops, and roller skates a lot. She is the head coach of the Long Beach Junior Roller Derby. (You may remember one of my previous columns.) Both the hula-hoop and roller skating are on Mimi’s list to teach me. Please don’t wait for photos of that any time soon! The lunch was great! The owner of the Pike, Chris Reece, stopped by at our table to make sure everything was yummy. I love it when restaurant owners ask you how you like the food. If you haven’t been to Pike Restaurant & Bar, it’s worth checking out. According to Mimi they have the best cocktails in town, and have great happy hour specials. I loved the steak burrito that I had so I’ll be back for sure! As for the tattoo that I want, I’ll sleep on it a little longer, I hear it stings. Make it a Burrito day! 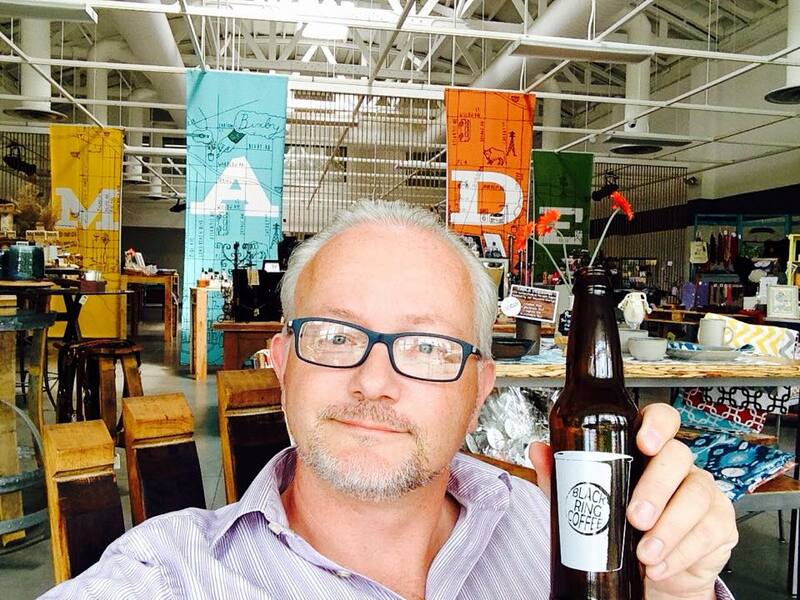 Sure it’s fun to “shop local”…. 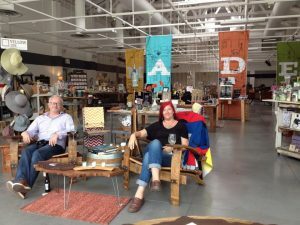 Shopping local seems to be the “in” thing to do lately. But shopping locally can be harder than it sounds. At least little me thinks so. Where are these so called local shops and their local owners? Are they really local? What does local mean? I’ll just go to one of the national chains to find a cool present for my friends, it’s easier, everything is in one location and I’m sure I’ll find something unique. “Hey hold on a second Dutch guy..!” When an entity called ‘Localism!’ was founded, they must have read my mind! Social media is really the only advertising M.A.D.E. does and with a rate of 1,000 likes per month the community support has been amazing! The space is set up for mixed use. The front is the main part of the store, with over 85 vendors. Independent makers and merchants. 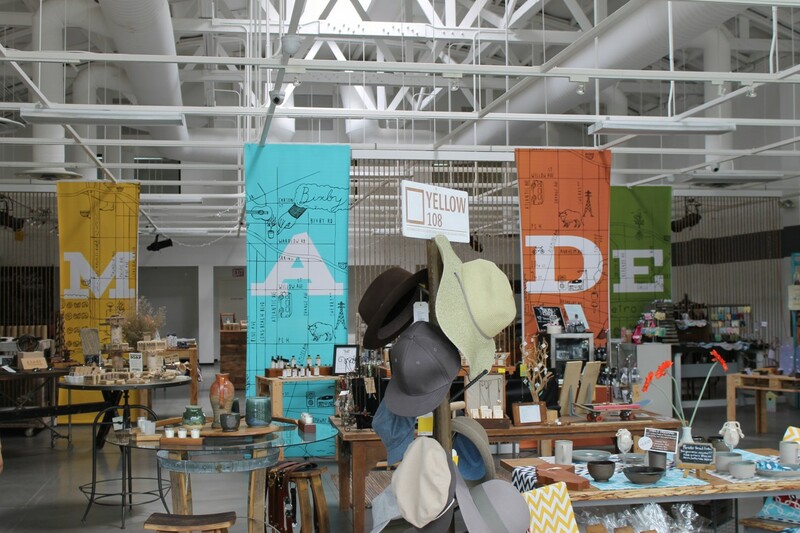 You can find jewelry, awesome soaps, cool furniture, rad lamps snacks, bicycles, pickled foods, and so much more. Every dollar spent in the store stays in Long Beach. 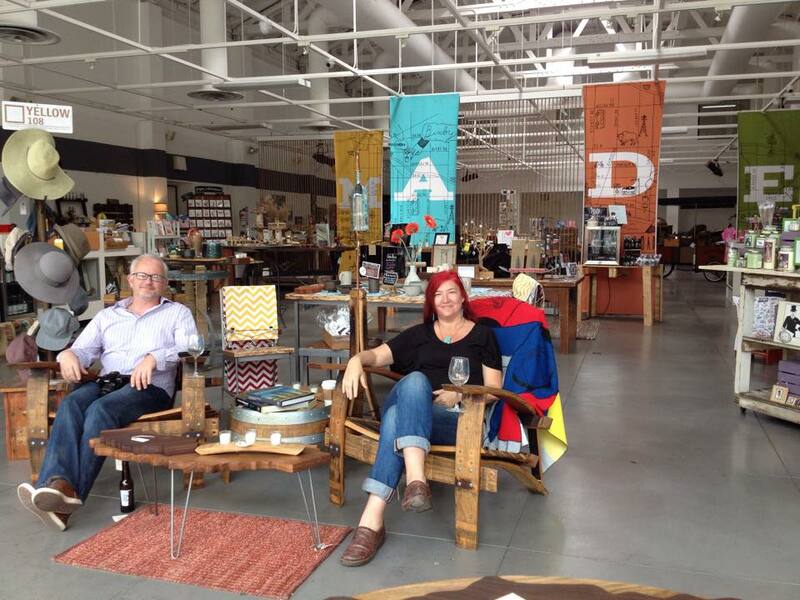 Shopping local has money recirculate in the local economy and that’s pretty cool! The back of the space is used for events like a Record release, Poetry night, a Green Drink event, or a Publishing launch. On Saturdays you can find Black Ring Coffee, pouring you a cup of coffee, brewed with care. (I actually savored their Cold Brew when I had lunch with Heather, Yumm!) and The Pie Bar, with some very homemade deliciousness. I really invite you to try them out on a Saturday, soon. I now know that stores like this really help the local economy, bring the community together and are just plane fun to shop at! Whether you intently want to shop locally or are just looking for some great merchandise, when in Long Beach, you really should walk into M.A.D.E. and check it out. Did I tell you yet that they are Bike & Dog friendly… I am so taking Eland and Maaike there next time! When you live in a world far away from the ones you grew up with, it is a great experience when they come and visit you! My brother Martijn recently visited us. Martijn is 3 years younger than I, has a job, he lives mostly independent, is mentally handicapped, and he is a painting artist, he plays more sports than I ever will (tennis, he even has some gold medals from the Special Olympics, horseback riding, and skiing), Martijn is Autistic, he is my hero, and he wanted to come to California and visit my wife and I all by himself on the plane and so he did! He visited my wife and I for two weeks in our home in Long Beach. What a treat to spend time with him. We were fortunate enough to be gifted tickets upon Martijn’s arrival by one of my friendly clients who knew Martijn was going to be in town and who happens to work at The Magic Kingdom! So we spent a day at Disney taking in all the fun! Since Martijn likes video and photography, we documented a lot of our trips. We enjoyed the little things that make being together special. 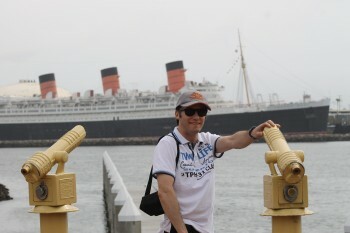 He was intrigued by the pelicans when we visited the Queen Mary. Trying to get as close as possible to get a great photo taken. awesome views of Catalina Island. 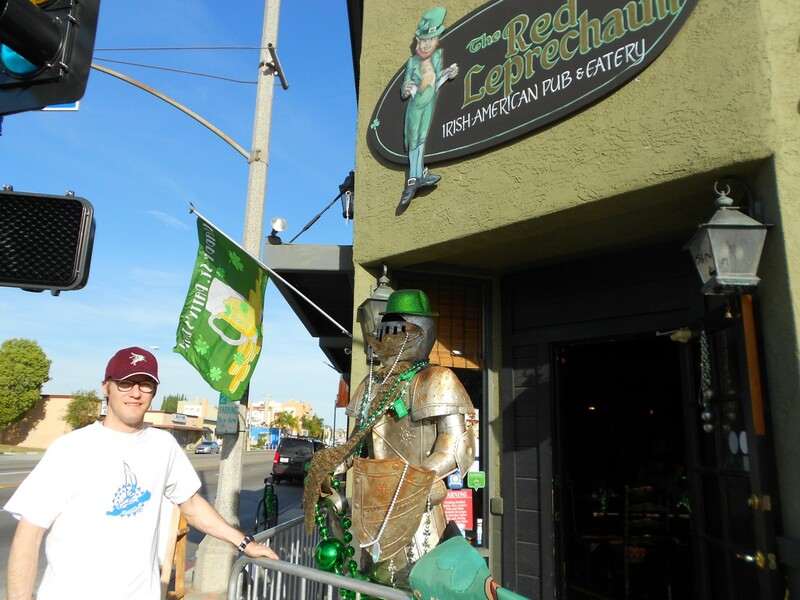 Of course he wanted to visit the Red Leprechaun Pub when the St. Patrick’s Day celebrations were going on. He loved the Irish dancers, amazing what a work-out that is! The First Ever Long Beach St. Patrick’s Parade was fun also. Martijn took a lot of photos and loved the green popsicles tossed into the crowd by Marko’s Treats. Shhhhh, his brother the 562HomeGuy sponsored Marko and the Ice Cream. 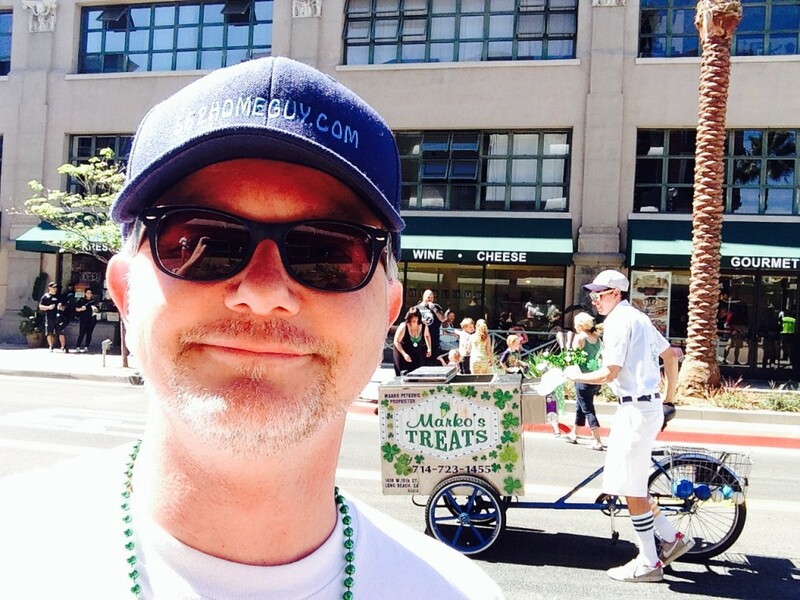 Robin buys Markos Treats for entire parade! This little story started out on Facebook. Even though social media isn’t all that social in my opinion, it does help you stay connected with friends far and near and keeps you updated on what they are up to. One of my Facebook friends is very passionate about a certain city park, Lincoln Park. 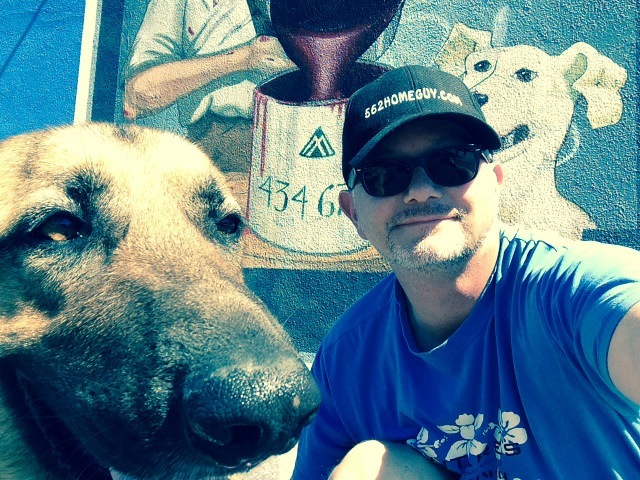 The other day I decided to visit the dog park in down town Long Beach. Not with our own German Shepherds, but just by myself. The goal was to get inspired to write my next column about our city’s dog parks. For some reason, and I don’t mind at all, I run into people that I know around town all the time. I was at the dog park at Lincoln Park, which is located on Pacific and Broadway, right next to the main library, and saw Allison Kripp coming from the library. She asked me what I was up to and told me that Lincoln Park is one of her favorite places in Long Beach. The park is the oldest park in the city, it was founded in 1897 as Lincoln Park. Before that it was known as Pacific Park. It’s always been a green spot in our city that has seen ups and downs over the years. Allison is involved with revitalizing the park with events like “Picnic in the Park” at which time tables, chairs and umbrellas are put in the park, and local businesses, artists and musicians can promote themselves while the public can enjoy a picnic, “Free & Fit”, “Yappy Hour” to promote the dog park, and coming up real soon a free bicycle repair workshop on Feb 8th from 10-11am. Actually all these events are FREE. Allison showed me around the park and, shame on me, I saw things I never noticed before. 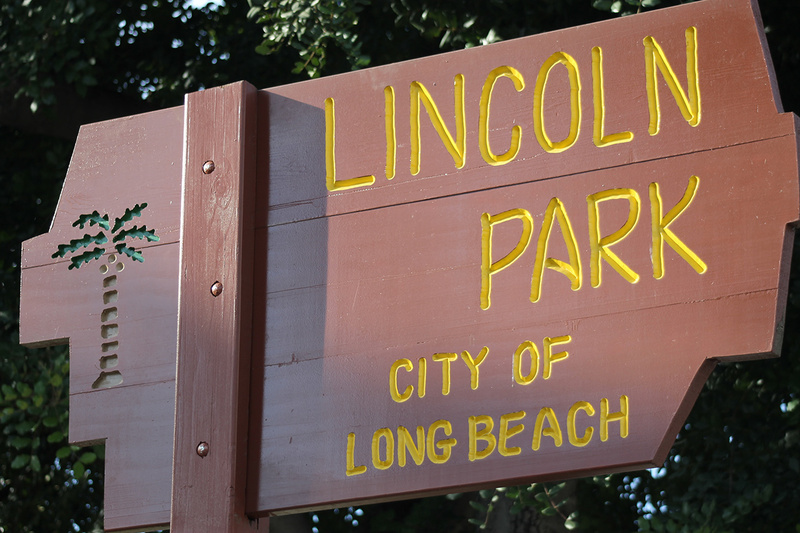 The park is now called Lincoln Park, and on Pacific at the entrance you will find a statue of Lincoln. I apologize for the seagull, it did not want to fly away. Art must be seen from a distance, hanging on a wall, and never touched by the admirer. That is what I heard growing up in The Netherlands, from my parents, teachers, troop leaders at my boy-scout group. Art was and still is everywhere back home. Since art is in the eye of the beholder, I can easily label art, as art. 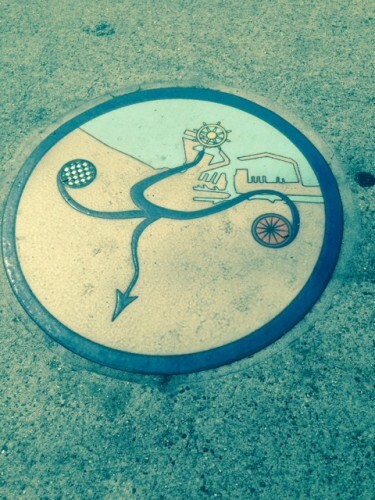 When I first moved to Long Beach, Second Street in Belmont Shore was my favorite street, close to the ocean, mom & pop shops, and the shadow-art casting from the parking meters. The one I like best is the dog leashed to a parking-meter, it must have foretold me that one day I’d love dogs, German Shepherds in particular. I suppose most locals know of Craig Cree Stone’s shadows, and at least have stepped on one or two of his creations. 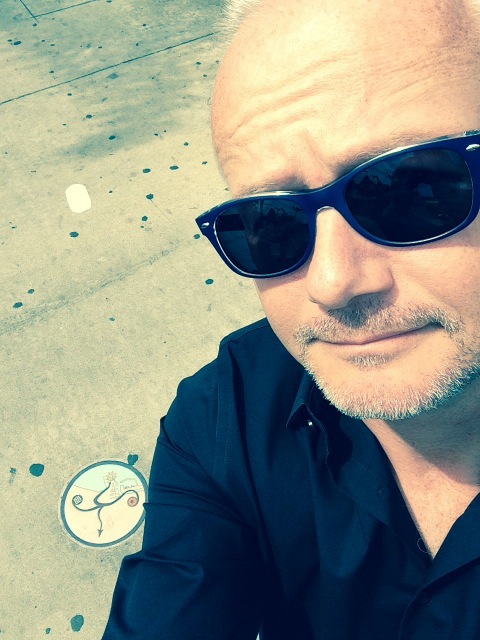 The other day, setting up open house signs in the 90806 zipcode of Long Beach, I stepped on art that I’d never stepped on before. At first I didn’t even notice them, 7 to 10 round obscure covers of I assume very important utilities known only to city employees. Then again, maybe it is just… art. 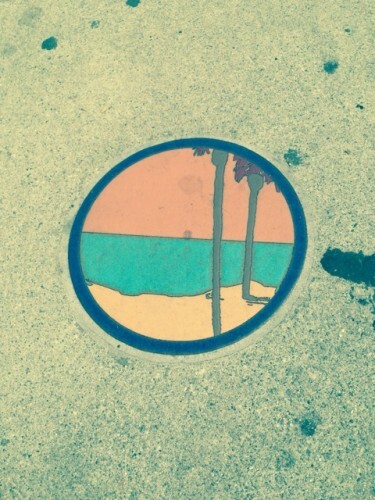 Two patterns, one “two palmtrees at the ocean shore” the other, a compass of sorts depicting the “Long Beach Harbor”. For now this is my favorite pavement-art in the city. 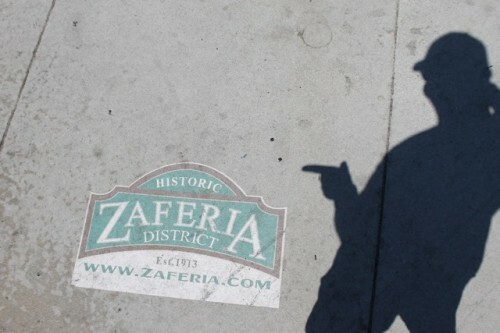 Another beauty is the steppable Historic Zaferia District. It’s close to home and I can step on it whenever I want. Have a great day, put your best foot forward. I don’t really know how many murals Long Beach has. quite a few I’d say. Every time I drive by one, it brightens my day. Colorful buildings make for a better urban experience. There’s even a Mural and Cultural Arts Program that has helped with the creation of at least 8 of the City’s murals. Those murals tell stories of our City and the people living in it. Here’s a link to those Murals. Covering huge bare walls and deterring tackers from covering Long Beach with ugly graffiti, these murals are just very cool. When walking Eland our German Shepherd, my wife and I pass by a mural that is our favorite, well mine at least. It can be found on Anaheim street, between Termino and Ximeno. Why? It’s not the most spectacular of murals, however, it has a dog on it. Yep, I know I’m a dog lover and there’s nothing I can do about it. Recently I visited family in The Netherlands and while visiting my favorite Chinese restaurant, I noticed a fun mural in the used to be dark and scary underpass leading to the strip mall where the restaurant is located. This place used to be full of graffiti and ugliness. Now it’s a colorful pass-through. The windmill, of course, is one of Holland’s trademarks. 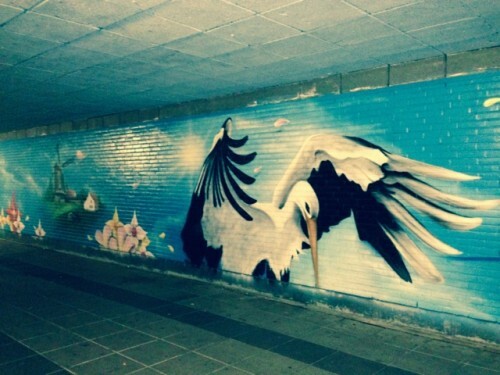 The stork represents the city of The Hague. The stork “ooievaar” in Dutch has been in the Coat of Arms of the city of The Hague, officially since the early 1800’s, however, pictures of the ooievaar have been found on church bells and buildings since the early 1500’s. Ooievaar means “bringer of good luck”. This story really started more than half a year ago at Mr. Yetis Pet Supplies, a local pet food store on Lakewood Blvd and Stearns. I was asked by the owner to dress up as that year’s Santa (sshhh Santa is real), and surround myself with all kinds of wonderful pets and have photos taken. Tons of fun! 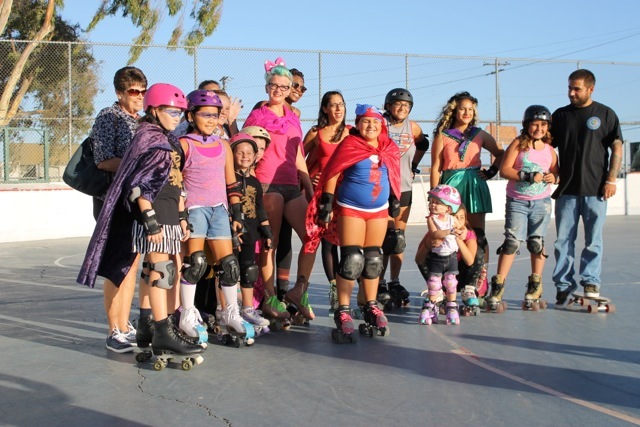 Of course, Santa needed Elves, and that is where Ms. Mimi Masher came in with her troop of Jr Roller Derby of Long Beach Girls. All dressed up as Santa’s helpers, rolling around the store and inviting people in while showing off their Skating skills. Ever since that day Mimi and I have stayed in contact. Mimi probably because I am pretty silly at times, me… Well, what can I say? Mimi is one of those unsung heroes of Long Beach. She is the coach of the Jr Roller Derby of Long Beach. She trains kids of all ages and abilities how to roller skate, has fun, be outside, feel the wind in their hair, be social, help others, and above all, to have fun. Every Monday night from 5.30-7.30 pm Mimi rallies her troop to go out to the rink and have fun. Many times there is a theme and this time around it was superheroes. One of my favorite themes. I grew up being Batman’s side-kick. Tonight though Batman didn’t show up and I was my own superhero. 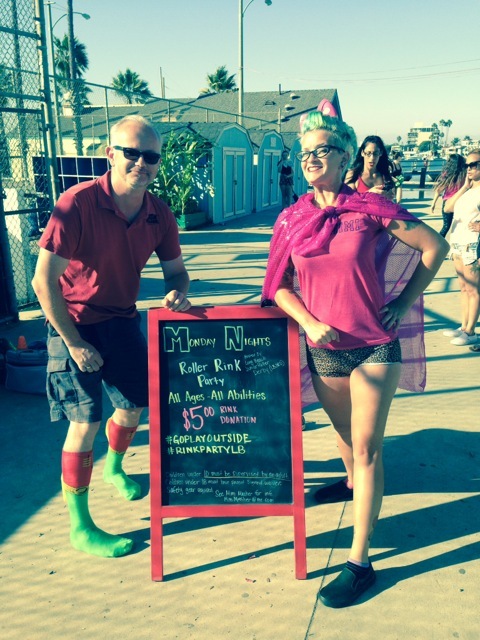 I had my socks, a gift from clients, and brought a cape that was whisked off by one of the kids. Everyone looked great. Capes were flapping in the wind and temps were great. Halfway the evening the music stops and the Hokey Pokey is done. Everyone participates and fun is had by all. Mimi does this all on a volunteer basis and you know what, that is awesome in my book! If you are interested in joining, visit www.LongBeachJuniorRollerDerby.com or find them on FaceBook for more info, heck, just show up and ask for Mimi! Go outside, enjoy our City, and roll a little!! When you are born in a bike loving country like The Netherlands, like I was, it is such a pleasure to see your town turn into Bike City USA, more and more. 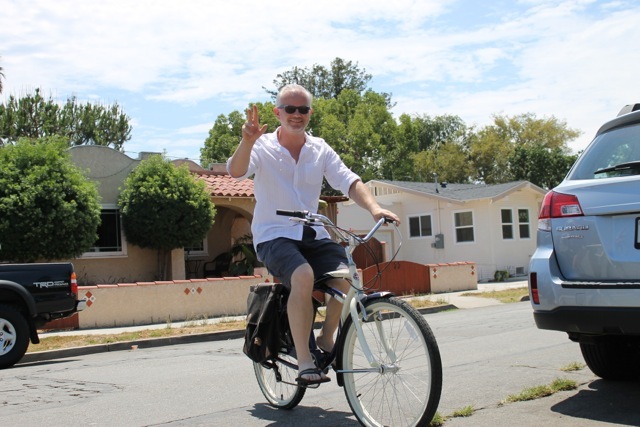 Long Beach is on the road to bicycle heaven. More and more bike lanes, trails, and signage are popping up all over town. 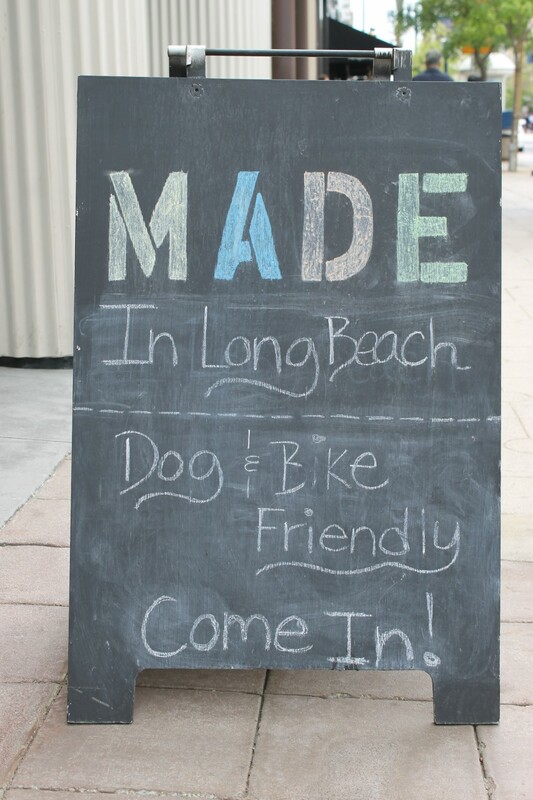 I do applaud Long Beach for offering local businesses a way to order for free, bike racks. There’s even a website where businesses can order the racks. 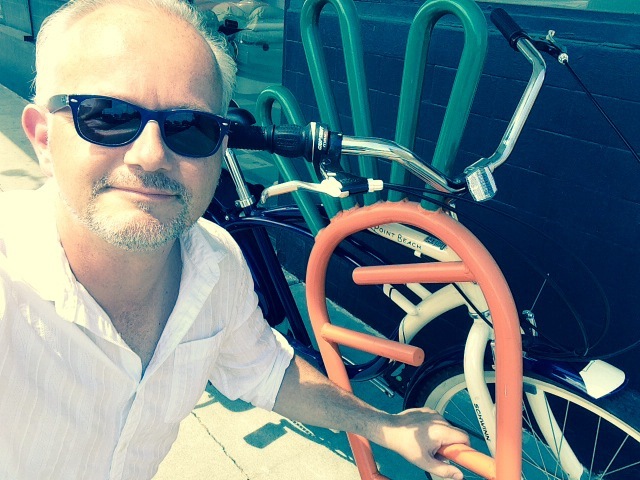 So it can happen that while taking a break from all the healthy physical exercise I found myself parking my bike up against a carrot. Yep a carrot! I’m pretty sure Long Beach is the only city offering me an experience like this. I took it all in and just had to take a photo. Robin, his bike, and a carrot! Are the current bike racks the prettiest and most practical bike parking street furniture I’ve ever seen? 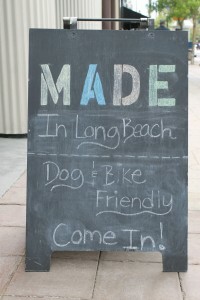 Probably not, but it is a start in making Long Beach bike friendlier. For now I make due with a cruiser, although I pimped it up with real Dutch “saddle bags” which I use to store water for the fun rides or pick up some groceries in. You’ll find me on a sturdier, ergonomically correct bike soon. If you haven’t tried out our city from the comfort of a bicycle, I highly recommend it. Fun, healthy, and you see much more of what Long Beach has to offer! What is a Sunday afternoon without friends to hang out with? In the last couple of years Long Beach (and surrounding areas) has turned more and more European-like-awesome. Breweries are starting to grow in numbers and fun little bars, restaurants and ?koffie?- shops have appeared onto the scene of, hanging out is fun and gets you out of the house. 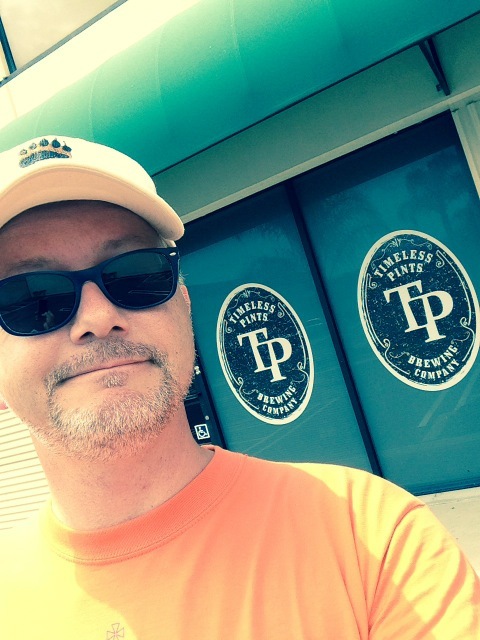 Last week my friend Deborah, who is a Long Beach Local Appraiser invited me to Timeless Pints. She brought her husband and I brought my much better than I ever will be, better half Elizabeth. TP opens at 1pm on Sundays and we arrived early. I know, that even without keeping track of my watch, I show up early. Not everyone likes it, however it has helped me on many occasions in private life and business. TP opened their door a little early because we were peeking inside. Before us was a clean, somewhat industrial looking space with on the right side the bar and in the far back the equipment a real brewer needs to craft yummy beers. A few large picnic tables and some 50’s diner high-tables and stools. The brewmaster’s wife Merri welcomed us in whilst she pulled the heavy chain that opens one of those industrial loading-doors. We sat down at one of the picnic tables and ordered a flight of 6 of the approx 12 beers on tap. 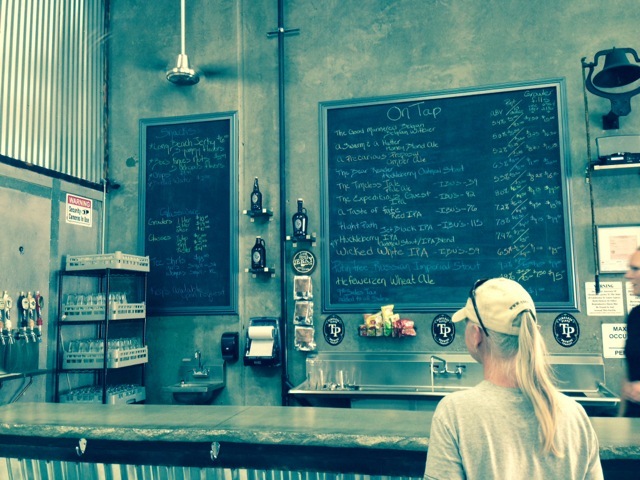 From light wheat to heavy-ish Huckleberry stouts to IPA’s. We spent a couple of hours chit chatting and some of my clients/friends who live close by joined us. Great time and definitely another great place to meet friends and be social. Long Beach is growing and it is going in the right direction. Officially Timeless Pints is in Lakewood, I think. It is located off of Cherry and the Long Beach Airport. Enjoy the day, and if not? I will!